Shower floors are the repository for all the grime that comes off during bathing. The soap leaves a sticky film on the basin that attracts dirt and makes a ring. Hard water leaves mineral deposits that are hard to remove. Even a conscienscious cleaner will find that eventually the shower basin gets dingy. A little preventative rinsing after the shower will prevent some discoloration, but you still have to do battle with lime and scale. Instead of using scouring powders that can cause deep scratches in the shower's finish, choose a gentle cleanser to whiten the shower basin. Scrubbing with abrasives actually makes the staining worse on the shower basin. Start cleaning with the least corrosive or abrasive cleaning method you can find. Dish soap cleans off soap scum and is gentle. Sprinkle dry dish soap onto a sponge and moisten with water. Wash the bottom of the basin and rinse. If more cleaning is required, move on to another method. 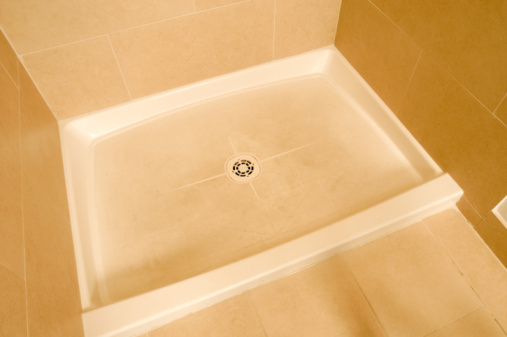 Remove the hard water deposits so you can get at the deep dirt in the shower floor. Add 1/2 cup of vinegar to 2 cups of water and dip a sponge in the solution. Rub the vinegar mix into hazy yellow areas. Most of the hard water deposit will be at the drain on a shower. Rinse the shower and let it dry. Use an eraser sponge on stains in the tub. Try it dry first, then add enough water to just dampen the sponge. Go over dye marks, dirt and rust spots. It is a gentle, effective cleaning tool that will remove many types of stains. Sprinkle baking soda over the floor of the shower. Squeeze lemon juice on the dry soda until you can make a paste. Scrub it in with a sponge and allow the cleaner to sit on the shower basin for at least 10 minutes. Rinse off the cleaner, and the floor will be brighter and less dingy. You can do the same treatment with salt instead of baking soda. Pour non-chlorine bleach onto the floor of the shower. Add a little water and swirl it around the bleach to make a paste. Use a sponge to cleanse the floor of the shower. Allow the non-chlorine bleach cleaner to work for 30 minutes. The bleaching action is gentle and can even be used on cast iron without yellowing. Prevent discoloration by rinsing the basin and wiping it out with ammonia after showering. This will prevent the buildup that caused the shower basin to look grimy. 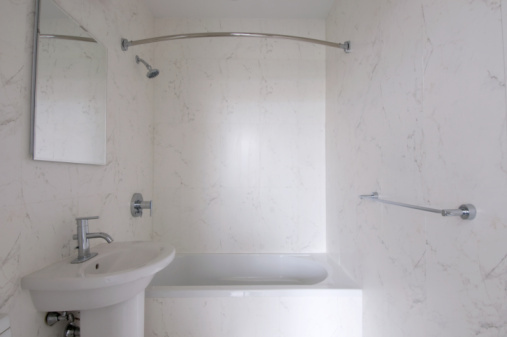 Can I Use Polishing Compound on a Bathtub?